And so I want to invite to our passage that will take a look at some of those things together this morning. We’re going to be turning to 1 Corinthians 11... for those of you who have a Bible with you or want to open one up in your pew it’s 1 Corinthians, chapter 11 there in the New Testament maybe half way through or so… if not that’s OK we’ll have the Scripture on the screen behind us. First Corinthians chapter eleven and I wanna just break this passage down we’re gonna look at, into a few little sections. 3. The PROPER WAY to take communion. “In the following directives I have no praise for you, for your meetings do more harm than good. In the first place, I hear that when you come together as a church, there are divisions among you, and to some extent I believe it. No doubt there have to be differences among you to show which of you have God’s approval. So then, when you come together, it is not the Lord’s Supper that you eat, for as you eat, each of you goes ahead without waiting for anybody else. One remains hungry, another gets drunk. Don’t you have homes to eat and drink in? Or do you despise the church of God by humiliating those who have nothing? What shall I say to you? Shall I praise you for this? Certainly not! So we find out that the Early Church had a habit of meeting together… by a habit I mean some of the churches met every_day together, but many of them met several days a week where they would get together in the evening, not on Sunday morning; but they would get together in the evening and they would have an evening meal together… they would have DINNER together; and in conjunction with that they would also celebrate The Lord’s Supper. 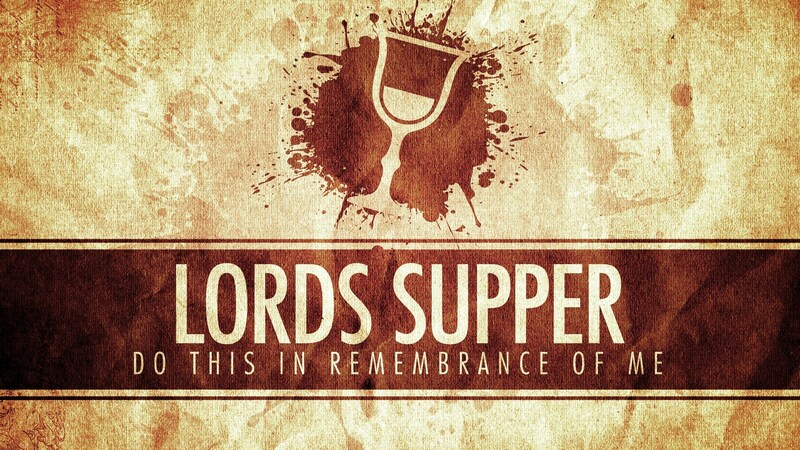 Now they didn’t celebrate The Lord’s Supper once a month, or once a week like many churches do; but they would have The Lord’s Supper every time they got together and met. They would have a meal and it would just sort of blend in to the meal… and they were sort of combined together. Ya know here, if we had a gathering at Kirkmont and we said, “We’re gonna have dinner together and then have The Lord’s Supper … we would probably meet WHERE for dinner? …down at the Fellowship Hall; we’d eat together and then we’d probably have communion WHERE? … we’d probably come back on down here and have communion. It would be very separate and distinct things. The wealthier people who either didn’t have to work or were able to get off work early would show up to the meal FIRST. The laborers who had to stick around longer and couldn’t be there until later. Now the problem with that is that the people who were showing up first didn’t even have enough consideration for each other to wait to eat till others got there. So instead of the Spirit of Fellowship and communion together, they were just looking out for their own needs and filling themselves with the most food and the best foods. And then you’ll also find in the passage, you can see some of these components, that alcohol or wine was served at these meals, and many of these people who got off to an early start eating would get off to an early start drinking as well… so that by the time they were really supposed to be focusing on the Lord’s Supper they were STUFFED having eaten first, not thought of each other, and also INTOXICATED as well. When I was in college, I went to a Christian college and quite frankly what many of the students did on Friday and Saturday night are exactly what students who didn’t go to a Christian college in our country do on Friday and Saturday night. 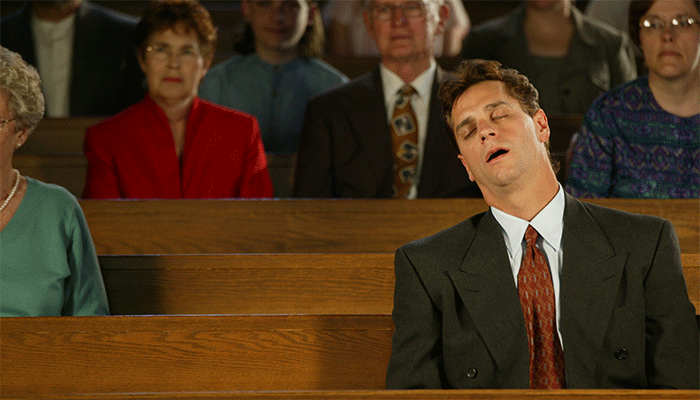 And so some of our students would drink too much and they’d wake up and they’d roll out of bed; they’d barely get to church service for the 11:30 service; they were too tired and sleepy and hungover to pay much attention to the sermon, then all of the sudden COMMUNION was placed in front of them. You’re able to PARTICIPATE without PARTAKING in communion. Well think about today, we have this idea that maybe many of our adults are older who have decided they’re not married, but they’re old enough… or they’ve been married and they’re not married anymore but they don’t think the rules in the Bible about what they should do with their boyfriend or girlfriend outside of marriage really applied to them. So they spend the night together on Saturday night, they wake up they come to church and they have communion together and never think anything about that at all. Or maybe you’re like our family. When we did start going to church, things were crazy. I mean we never fought more than when we started going to church… because trying to get to the same place at the same time in the same car created a lot of stress for our family. So many of us have gotten into fights… and that was our household… and you’d come together and get to church you come in and sit down and everybody is all sort of flabbergasted and stressed and all this kind of stuff and then all of the sudden here’s communion. 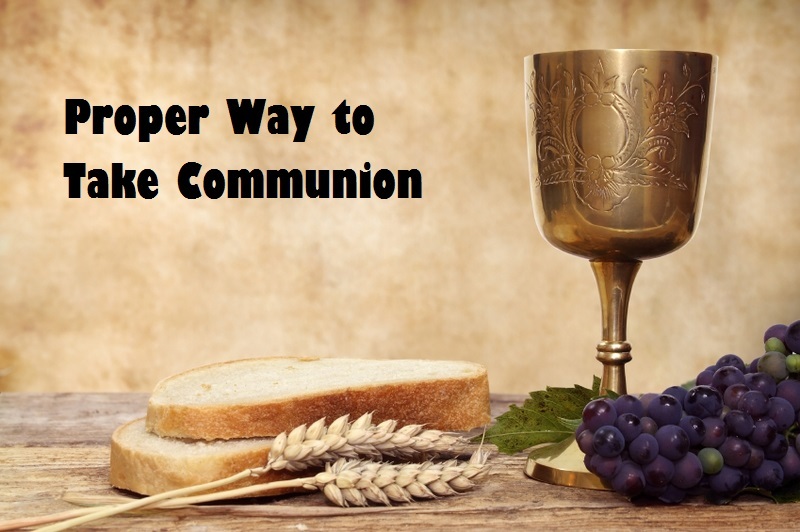 You’re able to participate in communion without partaking in communion. Now I have you ever wondered why is he taking the cup after after supper. The video we saw reminds us that that the Passover meal there was how many cups? Four cups… so in all likelihood this was the fourth cup that Jesus is now giving thanks for and using to show them about His Blood begin shed for them. 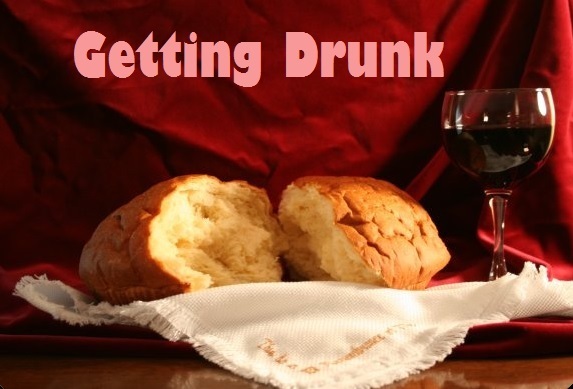 Now I want to be clear… these are not just Paul’s words; this is not just his instruction about communion. Not that if it was just Paul’s words that they wouldn’t be significant or meaningful. But what Paul is doing is reminding us about what Jesus did and what Jesus taught that night of the FIRST LAST SUPPER… if you will. He is reminding us of that reality, and there’s four men who wrote about the life of Jesus: a man named Matthew, a man named Mark, a man named Luke, and a man named John who all record that evening and they line up with what Paul is saying about what Jesus said and did at that moment. And at the heart of what Jesus is doing is he’s calling his disciples and you and I 2000 years later when we have this meal to think about His body being broken for us. 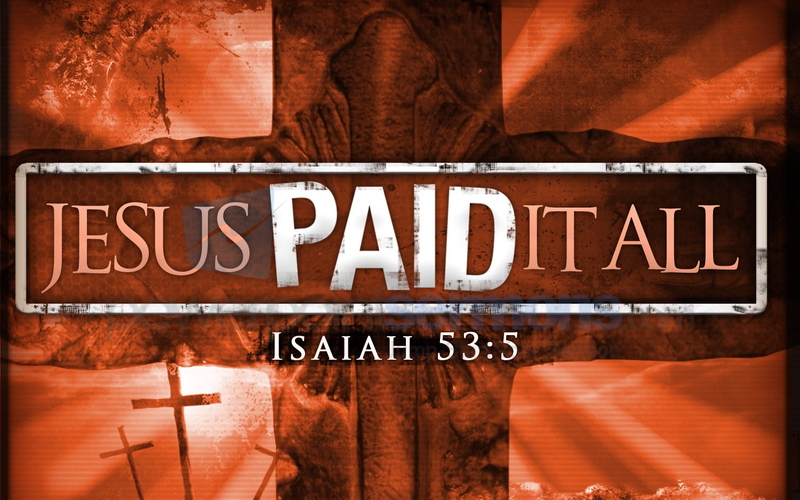 And His blood being shed for us. That ought to go through our mind and resonate in our hearts and our minds as we participate in the table. The God of the Universe, the creator of the heavens and the earth the one who knit you together… his body being broken and his blood being shed for you. That’s what Christ is calling us to. Now there’s a couple of LIES about Jesus on the Cross that I wanted I wanted to sort of debunk briefly because otherwise we’re not going to understand the power of communion and if we buy into these lies. Those are people who recognize that Jesus did some really miraculous things that are really so hard to just explain away. So the way they explain it is by saying, ‘God sort of filled this man named Jesus which allowed him to do some really miraculous things; but when Jesus was on the Cross, God then left him. So the only thing was crucified was not actually God but just some man named Jesus who lived 2000 years ago. The problem is that as Jesus said, at the Last Supper, while God was with him, and filling him, and speaking on his behalf here, he said that HE WAS GOING TO DIE ON THE CROSS. Now if under the inspiration of God this man named Jesus has said, ‘I’m going to die on the Cross for you and then God comes along and leaves and abandons him in the mist of that crucifixion it kind of makes God out to look like someone is pretty deceptive doesn’t it. “I’m going to die for you”… but actually he didn’t really die for him; he left and left Jesus to do it on his own. No… Jesus, fully human and fully divine stated that he would die for us; and Jesus fully human and fully divine did just that: He was crucified for us. But the problem is, if Jesus as merely a profit, it does beg the question, how can Jesus say that “My body is broken for you; my blood is shed for you”. What do you and I have to gain from some man who lived 2000 years ago dying?… not really a whole lot. But, instead we realize that if Jesus was a prophet, he was either a false prophet, and he was lying in that statement; or he was a prophet and so much more than a prophet. And I think that’s exactly what the Scripture teaches… that he was indeed a prophet, but so much more than that: FULLY God and FULLY human, both saying these words at the Last Supper and also fully God and fully human dying on the cross for us. 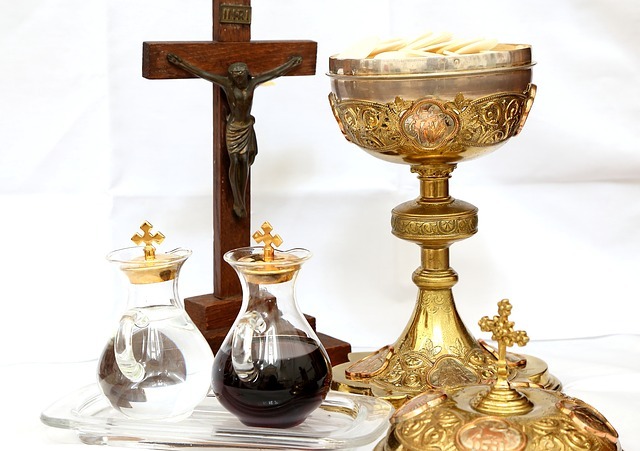 He’s inviting us Church… to make sure that we never participate in the Lord’s Supper without first reflecting upon his body being broken and his blood be shed for us. We are to realize what Christ went through … to ponder the horror of the crucifixion… to embrace the reality that God decided to come and to be amongst us, the Emmanuel, right about the time that man was imposing one of the worst death sentences that one could ever experience… and that is the crucifixion… it wasn’t by mistake… it was intentional. 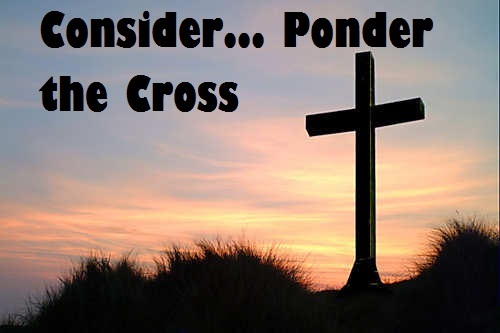 But he would come then to experience that and that we might realize what Christ went through to die on the cross for us. We don’t only come to the table though with a with a sense of sadness, we don’t come to the table was just this “funeral spirit”… there’s that element to it by all means… but we also call this table the Eucharist… a table of Thanksgiving as well, because we realize that Christ’s body was broken and his blood was shed for us…that we have something to gain from it and that is as the video tells us, Christ took the entire wrath that you and I deserve upon Himself. We can’t even begin to imagine how broken we are compared to the holiness of God and what that deserves and yet we begin to see a glimpse of that when we look at the horror of the Cross. But we realize that Christ drank that FULL CUP… the full measure of God’s wrath that we deserve He took upon Himself. So He invites us to think about not only what He experienced, but what he ACCOMPLISHED as well–the POWER of communion is for us to sit and consider, and to ponder, and to embrace what Christ has done for us on the Cross. “So then, whoever eats the bread or drinks the cup of the Lord in an unworthy manner will be guilty of sinning against the body and blood of the Lord. This is a reminder, telling us, ‘if we don’t take the time to consider what Christ has done in breaking His body and allowing His Blood to be shed, then we are ultimately making LIGHT of what He did on the Cross for us. For those who eat and drink without discerning the body of Christ (or without recognizing the body of the Lord) eat and drink judgment on themselves. I wanna pause there… so I think what the Scripture is telling us is, ‘before we come to the Table together we’re supposed to first EXAMINE ourselves and we’re supposed to also RECOGNIZE the Body and the Blood of our Lord’. What do we mean by examining ourselves? WE DON’T EARN OUR WAY TO THE COMMUNION TABLE. And there’s nothing that you can do on a Friday night or anything that you’ve ever done 20 years ago that haven’t told anyone else about that disqualifies you from having access to come to the Table. What we mean by examining ourselves is that the problem with doing those things is that so many people DO them and they show up to the table not ever thinking about what broken thing that they’ve done. But what the Scripture is inviting us to do is before we come to the Table, to take the time to realize WE_ARE_BROKEN… to think of those things, to ponder them, to realize, “Man, what I did last night is not appropriate for a follower of Christ and I’m coming to The Table with that brokenness in my Spirit”... to take the time to examine ourselves… that’s what he means by that. So that when we ponder our brokenness, then come to the table and we realize that that’s exactly why this table exists. There is a reason why we here at Kirkmont are unwilling to say to people in this world and to buy into the LIE of this culture that says, “You know what… whatever you want to do you can do it it’s totally fine. People who do things that we don’t agree with, are welcome to come here to Kirkmont. They’re LOVED and BEFRIENDED and just like anyone else… because quite frankly, we’ve all done things that we know we shouldn’t do as well …. “we count you as one of us in that sense”… but we’re unwilling to buy into the LIE that says “whatever you do is okay”. Because once we buy into that lie there’s no need for this table anymore. When you examine yourself, you’re supposed to see that you are broken and you need this table. But if you’re living under the lie that whatever you want to do is acceptable and pleasing to God, then when you examine yourself you’ll have no need for this table … their will be no point in it and any way at all. So we uphold the truth so that people can examine themselves and the truth of God’s Word, but then to give them a place to come to with_that_sin and guilt that they might experience forgiveness and mercy. 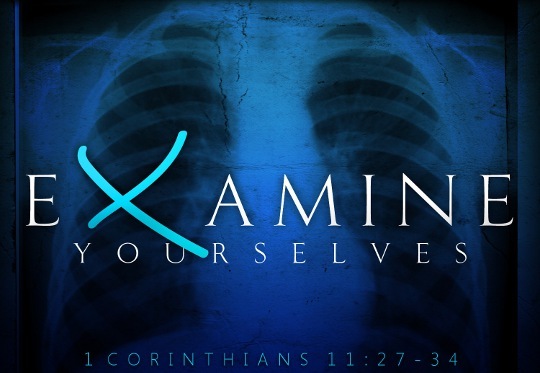 That’s what it means to examine yourself. Now it also says we need to CONSIDER, we need to look, we need to PONDER the body and the blood of Christ. You know there are people who examine themselves, but don’t really think about The Cross… the people who have plenty of examining of themselves… I mean they have so much guilt … they grew up in a church environment or a certain family environment that has given them all kinds of guilt and shame about the mistakes they’ve made…. they don’t need to examine themselves any further… they feel so bad about the things that they done; and they feel terrified about it… and you know what.. those people they’ve examined themselves plenty but they’ve never really come to the table having pondered The Body and The Blood of Christ. It’s so sad to think about how many people come to the table… with all of their guilt, having examined themselves, AND THEY LEAVE WITH THE SAME MEASURE OF GUILT… because they don’t PONDER and CONSIDER the fact that Christ’s body was broken for them, His blood was shed for them, that they might be made clean and new. It’s that beautiful combination of examining ourselves and then looking at what the Lord does in light of our shortcomings. I think of it like this: imagine yourself sitting at your home and paying your bills. You’re paying your bills and you got your balance, this is how much money is in your checking account, this is what you got to work. 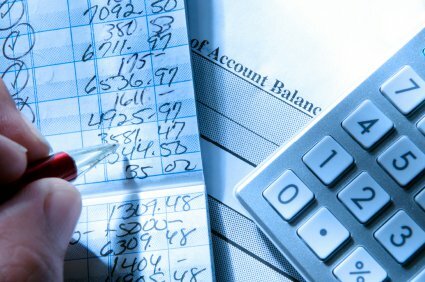 And you go through and you total up all your bills and the amount of your bills is greater than the amount of money that you have – that’s the EXAMINING YOURSELF. But then, just in that moment, right when you’re thinking about despair and all those other things, you realize, “that’s right there’s another check that I haven’t deposited and it’s plenty good enough and large enough to cover all of my expenses”. And I think that’s what Paul’s inviting us to do when he says, “Stop and exam yourself…” realize that you cannot pay the debt yourself, that you are broken, but then also CONSIDER what Christ has done and to realize that it’s sufficient for all of your failures, for all of your shortcomings. “So then, my brothers and sisters, when you gather to eat, (wait for each other) you should all eat together. Anyone who is hungry should eat something at home, so that when you meet together it may not result in judgment. In case you were sort of questioning my interpretation of the passage, that’s why I read this at the end so you could see that I was on the right track and that’s what was happening. Basically what Paul is doing, is he’s addressing their problem; he’s saying, ‘correct yourself’. If Paul through the inspiration of God was to write you a sentence or two to correct the condition of your heart or mind before you come to communion today, what would he say to you? What would God say to you if He needed to improve the condition of your heart and mind before we had communion together? For them they needed to WAIT for each other, to show concern for each other, and stop getting drunk. Now what would He say to you? I want to invite our elders who are helping us to serve communion to come forward at this time.